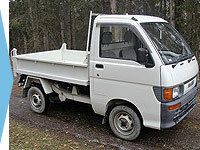 Cook Inlet Mini Trucks specializes in Mini Trucks (Japanese Mini Trucks or Kei trucks) directly imported from Japan. 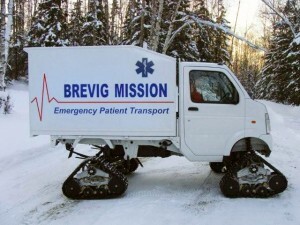 Mini trucks offer great versatility and can be customized for use as maintenance vehicles, small community emergency response vehicles, or security vehicles, or adapted for use in farming, ranching, hunting and fishing and much, much more. What makes a Mini Truck so interesting? The versatility, carrying capacity, comfort, safety, combined with the 4 WD make these Mini Trucks a great alternative to other utility vehicles. They can travel were regular vehicles are too large or too heavy, and can provide solutions there where budget restraints limit regular options. 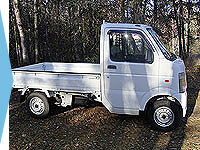 Click here for specifications of the Japanese Mini Truck. Click here for a photo gallery. 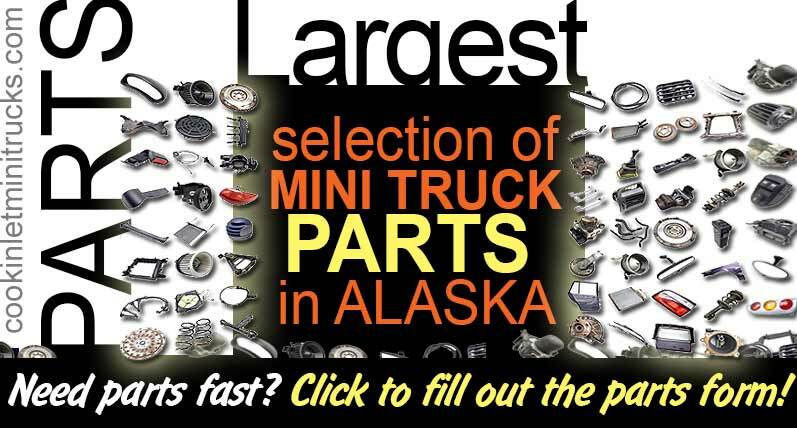 Cook Inlet Mini Trucks offers new and newer trucks with gasoline engines, vans, deck vans, and extended cab trucks (jumbos). On average, our Mini Trucks are are 10’6″ long and 52″ wide with a bed 6′ 4″long, 4 WD and equipped with 4 or 5-speed manual transmission. 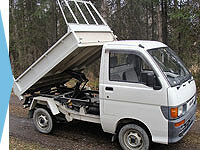 The bed sides and tailgate fold down and can be removed to make a flat bed. 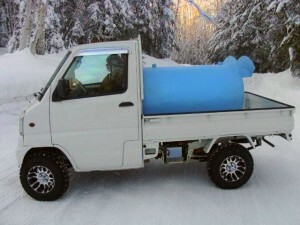 Mini Trucks are fuel economic, with 50 miles per gallon, and our trucks all have very low mileage. 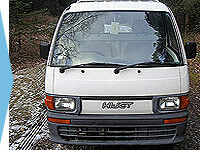 Mini trucks are equipped with windshield wipers, seat belts, headlights, a heater and can have an air conditioner as well. Click here for our current inventory. We offer a range of items readily available to customize any Mini Truck: custom cargo space interiors, custom storage compartments, lift kits, rear bumper with hitch, brush guards with front hitch, winches, plows, tracks, wheels, tires, spray-in bed liner,dump kits, and replacement parts.Click here to visit the Equipment & Options section. All of our Mini Trucks are first inspected by certified Japanese mechanics. Then we inspect the trucks when they arrive to make sure they meet our satisfaction, and do a complete service on all the trucks we receive (oil change, air filter, spark plugs and plug wires if needed, check cooling system).